A Rocket Racing League Rocket Racer featuring the DKNY logo. The RocketRacing League, a group of high-flying rocketeers eager to race each other acrossthe sky, will debut its new stock racer today during a demonstration flight ata Wisconsin air show. The exhibitionflight will mark the first public debut for the league?s Rocket Racer, a sleekrocket-powered aircraft designed for aerialtrack racing. More demonstrations are set for Friday and Saturday at the EAAAirVenture air show in Oshkosh, Wisc., where some 700,000 spectators areexpected. ?It feelsgreat,? Rocket Racing League CEO Granger Whitelaw told SPACE.com, addingthat he?s both cautious and nervous. ?It?s just there?s a lot that is importantabout these flights, not only for Rocket Racing, but for aerospace and generalaviation.? Foundedin 2005 by Whitelaw, an Indianapolis 500 veteran, and Ansari X Prize-founderPeter Diamandis, the Rocket Racing League is aimed at melding human spaceflightwith NASCAR-like competitions in the sky. The racers are designed to belch15-foot (4.5-meter) flames from their engines that can be easily seen byspectators, and carry limited amounts of rocket fuel to fly through athree-dimensional aerial race course. ?It?s thestart of a new industry, and certainly a new sports and entertainment company,?Whitelaw said. Six teamsare now on the roster along with a title sponsor DKNY Men, a New YorkCity-based men?s sportswear line that is also sponsoring the league?s BridenstineRocket Racing Team led by former U.S. Navy jet pilot Jim Bridenstine. Duringtoday?s demonstration, the league?s go-to rocket pilot Rick Searfoss will flythe Bridenstine team?s racer. The exhibition comes fresh on the heels of theprivate spaceflight firm VirginGalactic?s Monday debut of WhiteKnightTwo, an enormous carrier planedesigned to launch the SpaceShipTwo spacecraft on passenger trips throughsuborbital space, in Mojave, Calif.
?He?s justgoing to fly a very simple flight pattern, the plane has still got some more testingto do,? Whitelaw said of today?s planned flight. ?We just want to show itbasically and that?s it. And that?s a great step.? There havebeen some setbacks, Whitelaw added. Originally,Searfoss was expected to fly his racer througha three-dimensional track in the sky that fans could follow along withusing large television screens and helmet displays, but logistical challengesfor the screens? placement made it untenable, Whitelaw said. The league alsohoped to hold its first exhibition race between two vehicles this weekend usingthe Bridenstine team?s race - powered by a liquid oxygen and kerosene engine developedby XCOR Aerospace - and the Santa Fe Racing team vehicle, which uses analternate engine designed by Mesquite, Tex.-based Armadillo Aerospace that runson liquid oxygen and ethanol. Those races were slated for Aug. 1 and Aug. 2,but the Federal Aviation Administration (FAA) had yet to clear the Santa Feteam?s racer for exhibition flight using the Armadillo-built engine. ?It?s beenready to fly for weeks,? Whitelaw said, adding that he did feel somedisappointment since the Armadillo team did a great job getting the engineready. ?It?s the engine and its integration within airframe that the FAA has toget its arms around.? TheArmadillo engine should be clear for flight demonstrations planned for laterthis year at the Reno National Championship Air Races in Reno, Nev., betweenSept.10-14; XPrize Cup in Las Cruces, N.M., in late October; and at Aviation Nation atNellis Air Force Base in Las Vegas, Nev., on Nov. 8-9. But whilethe public may only get to see one of the two racers fly at OshKosh this week,there will certainly be a lot of face time with both of the rocket planes,Whitelaw added. TheBridenstine and Santa Fe racers, which are based on airframes built by VelocityAircraft, will be on hand for photographs and up-close scrutiny. The leaguealso plans to host a series of other events throughout the air show to discussthe history and future of its high-flying sport. Last week?sannouncement of the title sponsorship with DKNY Men also marked a major stepforward for the league. Not only is the fashion firm sponsoring the league andBridenstine?s team, but it also designed the flight suits to be worn by RocketRacer pilots and pit crew, as well as executive league clothing. 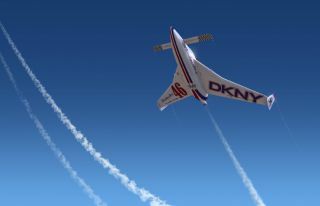 "RocketRacing is innovative, fast and fun - which also defines the kind of man whowears DKNY," said Patti Cohen, the firm?s executive vice president of globalmarketing and communications, in a statement. "This partnership is justthe beginning for both the brand and the sport." Whitelawsaid that corporate sponsorship is vital to extend the league?s reach to thepublic and investors, and that the DKNY Men deal is just the beginning. ?We?regoing to be announcing more sponsors, and I think that?s a good thing becausethen people can touch and feel a real rocket, and they can get more excitedabout it,? he said, adding that more exposure could also help otherspace-oriented firms like Virgin Galactic, XCOR and Armadillo Aerospace withtheir own private suborbital efforts. ?I think it?s a very important step inthe underpinning of the industry. I don?t know if there can be a more importantstep quite frankly. ?